Metals are important, and all metals are rewarding; but after many years working with various metals at many different scales, Matthew arrived at cast iron - now his main, though not only, material. 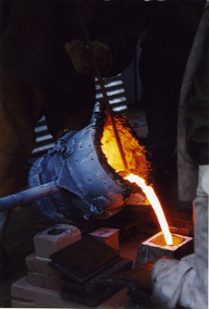 His furnace first ran in 1999 and has been in regular use since then: he is now one of the very small, but growing, group of artists, designers and makers worldwide who are bringing this material, with its long and rich tradition, into the 21st century. His award-winning work covers a variety of styles, purposes and directions, balancing ideas with the unique demands of the material. Most of it exploits the natural contrast between the dark as-cast surface of the metal and its bright interior, and often sets constrained outside forms against edgier inside marks, mass against delicacy, or solidity against something cut and removed. His is not a typical iron foundry in any way. For most of the time it is a one-man operation; he casts only his own work and that of visiting artists; and the techniques used mean that no design can be repeated precisely. Broadly similar editions are possible for some pieces, but most are unique.